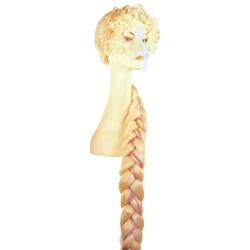 The braided Rapunzel Wig features blond wig with curls towards the front and a long braid in the back. The wig features an elastic band for a comfortable and secure fit to almost any head size and is available in platinum blonde. Ponytail measures 45" long. This wig is perfect for Rapunzel and can be used in the show Into the Woods.